I MADE THIS FOR DINNER LAST NIGHT. It was so succulent, fragrant and delicious that I made it again today, for lunch. It’s a complete meal of perfectly seasoned chicken and veggies, all cooked together in parchment paper, or what the French call “en papillote.” Gluten-intolerant? Avoiding carbs? This elegant entree is for you. 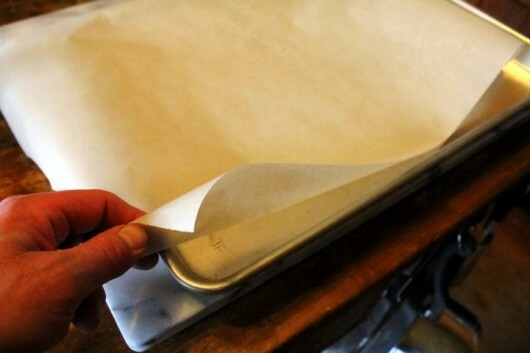 First, place a piece of parchment paper (approximately 13×18-inches) on a baking sheet. 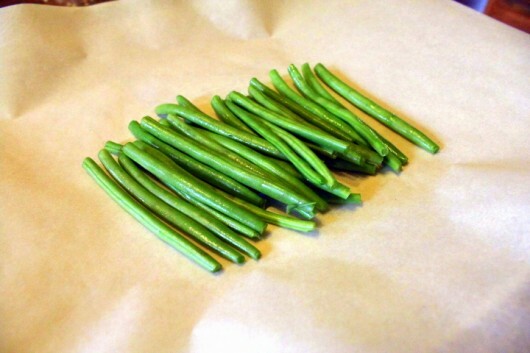 Then lay a handful of raw, trimmed green beans in the center of the paper. 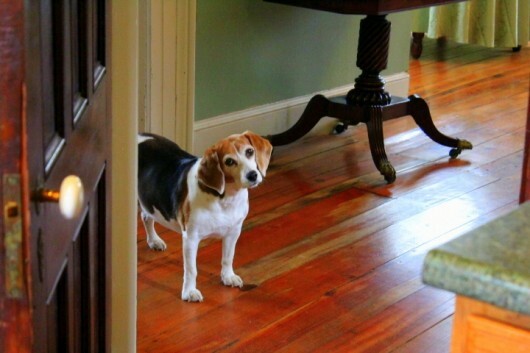 And then say “hello” to your beagle, who, surprise, surprise, has just appeared at the kitchen door. And add it to the veggie combo. 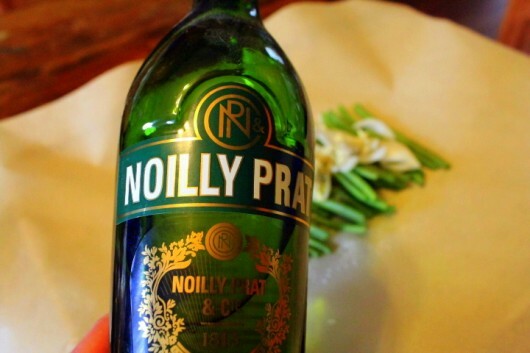 For added flavor and perfume, splash the works with a little dry French vermouth. You could substitute white wine here, I suppose, but vermouth is so much nicer. It is blessed with a special, herbal flavor. 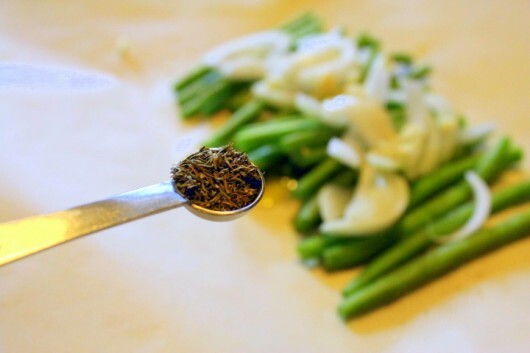 Also add a small pinch (about 1/8 teaspoon) of dried thyme leaves. Next, arrange two skinless, boneless chicken thighs atop the veggies, and drizzle them with olive oil. Top the chicken with a tiny pinch each of salt, pepper, and — because it smells so wonderful — a big pinch of dried tarragon leaves. You can wrap the parchment over the entree any darn way you wish. As you can see, I fold mine into a simple package. Just don’t wrap too tightly — there must be room for a cloak of steam to develop. Bake on the lower-middle level in a preheated 400°F oven for 35-40 minutes. When you open the package, a fragrant burst of steam will arise. Inhale deeply — the steam is one of life’s little pleasures. Now, you could eat this feast directly off the parchment paper. And transfer the arrangement to a plate. For added color, I sprinkled chopped, fresh parsley over my meal. And what a meal it is! The veggies are perfectly steamed, and the chicken thighs are tender, fragrant, and screamingly-succulent. Set the oven rack at the lower-third position; preheat the oven to 400°F. 1. 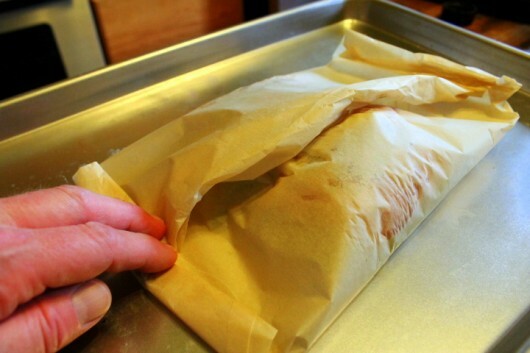 Place the parchment paper on the baking sheet. 2. 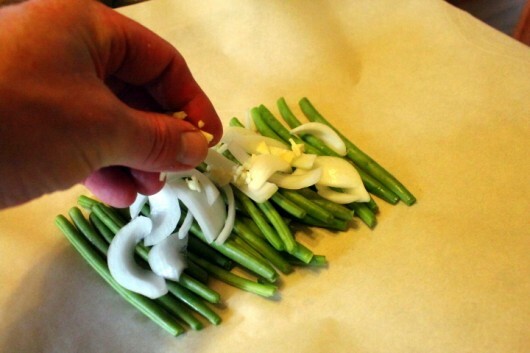 Arrange the green beans in the center of the paper. 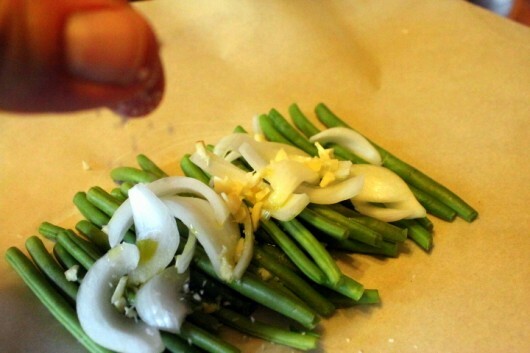 Top the beans with the onion and garlic. Give the veggies a drizzle of olive oil, a sprinkling of salt, pepper, and thyme, and a short splash of vermouth. 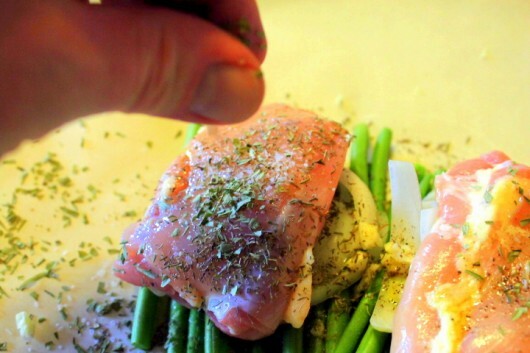 Place the chicken thighs atop the veggies, and dress them with a little olive oil, a tiny pinch of salt and pepper, and a big pinch of dried tarragon leaves. 3. Draw up the two long ends of paper, and fold them three times, pressing the folds firmly to seal. Don’t fold too close to the chicken — there must be air space in order for a cloak of steam to develop. Fold each end of the package 3 or 4 times, and press firmly to seal. 4. Bake in the preheated oven until the veggies are perfectly steamed, and the chicken is tender, succulent, and thoroughly cooked — 35-40 minutes. 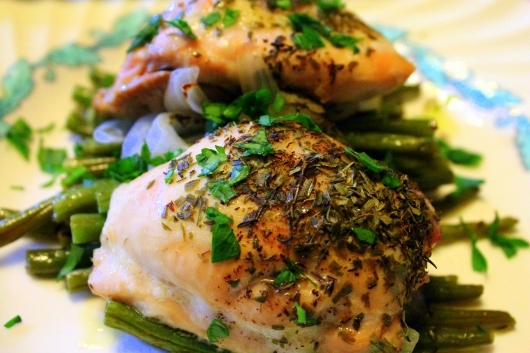 Think you’ll try this gorgeous low-(or no-) carb entree? You can let me know by leaving a comment. As always, I love hearing from you. I am always looking for a new chicken recipe, this one I will definetly make! Looks delicious and easy! Looks wonderful … for two servings – would you do them in two separate pouches? Hi Jeri Erman – You are right — one pouch per serving. I adore chicken thighs and am always up for a new recipe. This one looks so easy. I made your Purple Poulet again but used chicken thighs this time and it was wonderful. It looks delicious and I can taste it in my mind. This is something I will do. I am watching my carbs right now and that looks delish! Not to mention healthy! Kevin, you’ve done it again. This one is definitely a keeper and would make a great company dish. I get organic chicken thighs at Costco so I will be making this one for sure. Can’t wait for your book! Thank you; I have a package of chicken thighs in the ‘fridge for dinner and was going to make boring old cacciatore. Not now! I’ll bone them out and go French! Looks so so easy! 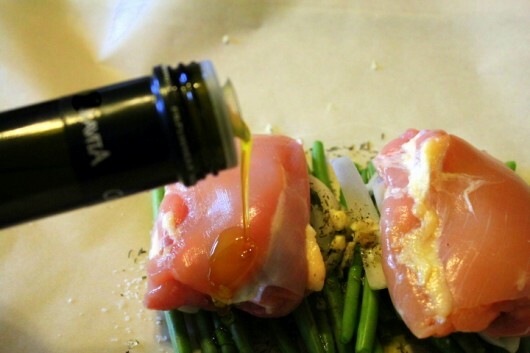 I use chicken thighs all the time so will definitely try this ! This looks fabulous! I am definitely going to make this soon!!! I have everything but green beans. I’m thinking of substituting asparagus . Dinner without pans to scrub? Of course I’ll try it! Looks wonderful! We will have to try this very soon. Love your weekly emails! Can you use boneless chicken breasts instead of thighs? If so, will it change the cooking time? This looks like a perfect dinner to make with my grandchildren . I wonder if they will believe me if I tell them the chicken is cooked in the even in paper ? Looks yummy and simple, can’t wait to try! 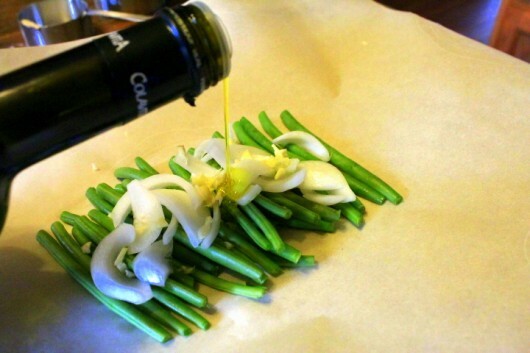 Will definitely try this, especially with green beans from my garden! How’s the book coming along? I can’t wait, it is on my wish list! Thank you Kevin! I have tied fish this way, but never chicken. Guess what’s for dinner tonight? I can’t wait to try this! I love thighs but husband won’t eat dark meant. If I substitute breasts, should they be filleted and/or should baking time be changed? Thanks! Hi Kevin. This dish looks divine. I believe I will try it with small boneless chicken breasts. Thank you for the recipe! Absolutely fantastic; so very much more than the sum of its parts. Sorry, I’m gushing…but this recipe was so good. Forwarded it to our daughter who’s been ‘low-carbing’ for some time. I made it the night you posted it; had always been afraid of the “boiled” connotation attached to cooking in parchment. Not at all…just a whole bunch of yumminess. I also very much enjoy your blog-tours and am looking forward to visiting on the GC Open Days. For Becky: I thought I had thighs for this recipe but didn’t. I had some really big breast halves from Sam’s and substituted (cut each half in half crosswise because they were so big). Didn’t change anything else. I would imagine supermarket breast halves would need to have a shorter cook time and the beans might not be cooked through using the smaller chicken breasts. With the big pieces I used, the beans were fine. How about saving one for cold lunch? I just LOVE your website! 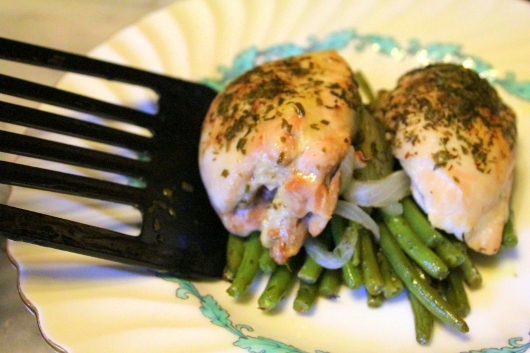 The chix thighs YOU cooked are similar to the ones I cook with tarragon . . . the French version . . . very fragrant, bus sans parchment paper. I do them just in a pan in the oven with the same seasonings . .. no onions, of course (Mom & Hubby not too fond of them!). 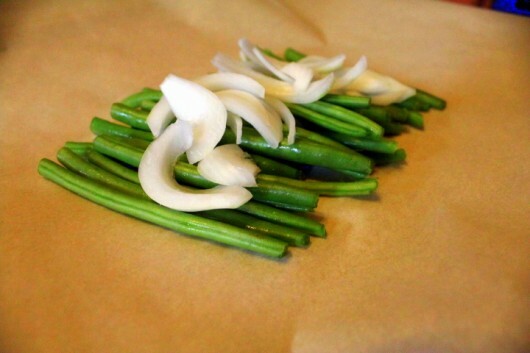 My favorite is shallots or scallions . 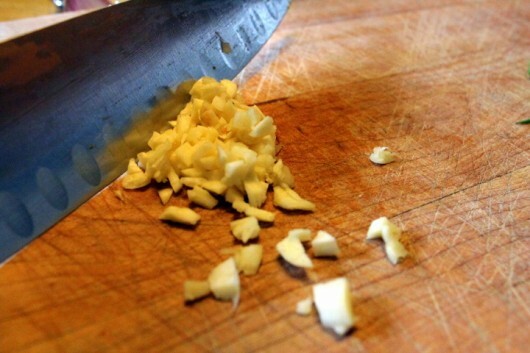 . . be careful how much due to the scallion’s very potent flavor! Thanks for the tip about Vermouth. And, I always DRINK white wine when I cook!!! Sometimes I even add it to what I’m cooking, depending on the dish! By the way, your Beagle reminds me of the beagle we had as children, my 2 brothers & I, whose name was “Topsy.” Great fun, beagles. Nosalgia . . .
I’m an amitted thigh junkie. I will be trying this one very soon. It looks delightful. Never mind the easy cleanup. Your email / recipe came through earlier today (Melbourne, Australia). I had the ingredients (mostly….I had chicken and beans! ), so I trialled it for dinner. Absolutely fantastic. Did a bit of improvising so I didn’t have to rush out to the store. Used leek instead of onion, fresh thyme, and a splash of white wine vinegar instead of Vermouth (which is now on the shopping list). Smelled devine, and we ate them out of the paper. This won over the 7yr old. He asked me to make it again…..for breakfast! As promised, I tried this recipe last night and it really is a wonderful Sunday supper dish. My mind is reeling with possible ingredient combinations to try with this cooking method. Thank you! This looks fabulous. Thank you, Kevin! Made theis for dinner tonight (and some extras for leftovers for tomorrow) ~ was wonderful. I have a question tho whether there was a specific reason to use parchment paper versus foil? I had a hard time getting my parchment paper to fold and seal very well (and still leave air around for steaming). I may have overloaded each pouch – the thighs I used were pretty big. We really enjoyed the broth it created also! Next time I might make a side of quinoa and spoon some of the broth over it to flavor it up. We didn’t let it go to waste this time tho – we just drank it up like soup! Thanks for the recipe! I made these tonight for dinner. They were fabulous! I made enough for tomorrow’s lunch. Thank you for this wonderful recipe. Going to try these tonight for dinner, first night in our home in Uruguay so wanted something easy, tasty and looks divine, this sounds like each category will be met, using fresh chicken breasts here so will reduce the cooking time and will add some julienned green peppers also, as we both eat only white protein but loads of fresh fruit and veg. Oh my mouth is watering, can hardly wait till dinner time. I;m trying this tonight….using a breast for hubby, a thigh for me in same packet. Will post how that works. It looks wonderful and thank you for the lovely recipe – I have a freezer full of (cheap and cheerful) chicken thighs so am always looking for new ways to cook them. Tried it earlier this weeks. Wonderful. We’ll definitely make it again. Thanks. I made the dish last night using very plump thigh and breast in the same packet. I baked it about 50 minutes — it was perfect. Probably could have baked it less, but was side-tracked and forgot to take it out at 40 minutes. Loved the clean up! Just the thing to make for my aging parents and easy clean up too! Really enjoy your posts! Hi, Kevin – I made this tonight. My wrestling with the parchment paper was sitcom fodder, but I’d forgotten that you can rub it the wrong way against a counter edge and undo the curl. I ended up using skewers to hold the short ends of the parchment in place. In any case, i didn’t have boneless, skinless thighs so I stripped them of their skin and left the bone in – they were larger than yours but it worked.The end result was delicious, and elegant enough to serve to company. Many thanks and keep them coming! P.S. I sprayed the baking sheet with some Pam to keep the parchment in place. I know this is a very late comment but I made this tonight (with breasts because it’s what I had in the freezer) and it was TERRIFIC! Going into my “go-to” weeknight meals. Thanks, Kevin!!! Hi Amy – So glad the recipe worked out for you! 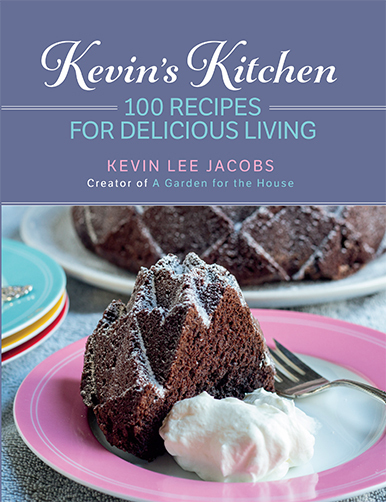 i have been looking up some of your recipes, and love them. I’ve tried many with success. Tomorrow night we are having a friend from Vancouver, and i’m going to make these…they sound yummy! 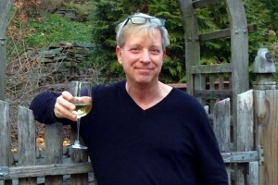 Hi Lise – Thanks so much for writing. 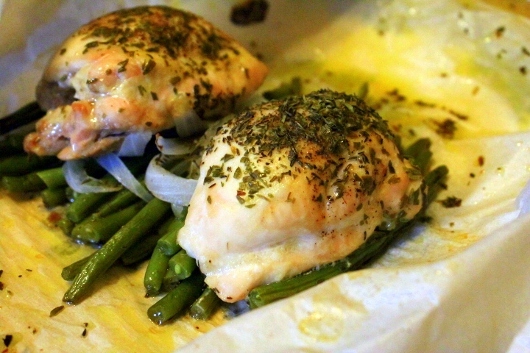 Enjoy the chicken en papillote! 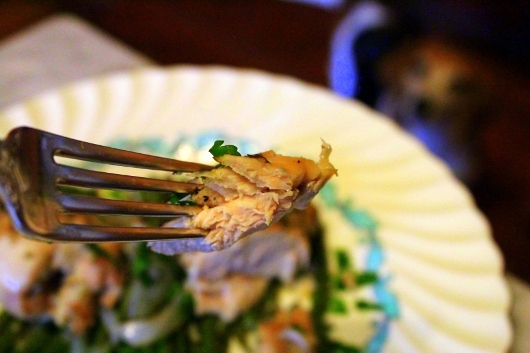 I was very fortunate to come across this recipe – I had company for dinner and I made it with the thighs; I also made it with salmon as two of my guests do not eat chicken. Both the thighs and the salmon were delicious and my guests were very complimentary (not to mention that the presentation was beyond words!) This recipe will now be a “go to” for me. Thank you again for helping to make my dinner party a success. I am using this recipe for this evening’s dinner. I have thighs for which that I will use the recipe and then vary it with different spices and sauces for 8 different conclusions. Thank you for this recipe. A couple of weeks ago, tis technique was illustrated on Dr. Oz’s show. You beat that by 2 years. Kudos. Thank you! This recipe has become my go to! Yum! Yum!